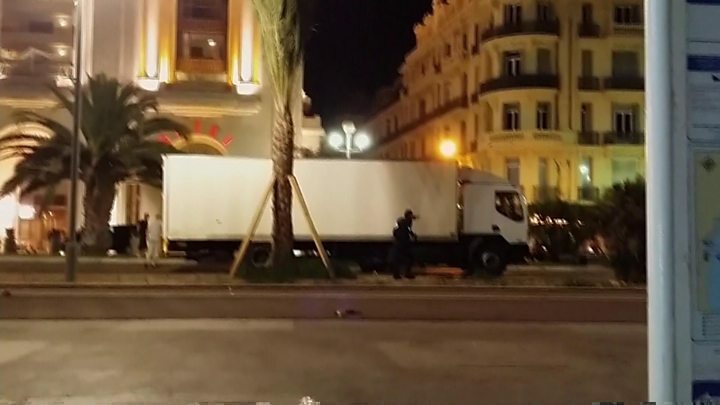 Prosecutors said Lahouaiej-Bouhlel had driven the lorry 2km (1.2 miles) along the famous Promenade des Anglais and fired at police before being shot dead. 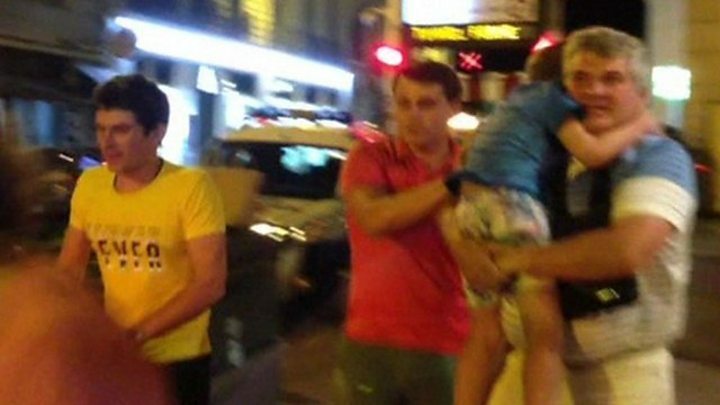 The attack happened as thousands in Nice marked Bastille Day on Thursday. Lahouaiej-Bouhlel drove the 19-tonne lorry into crowds at about 22:45 local time (20:45 GMT). 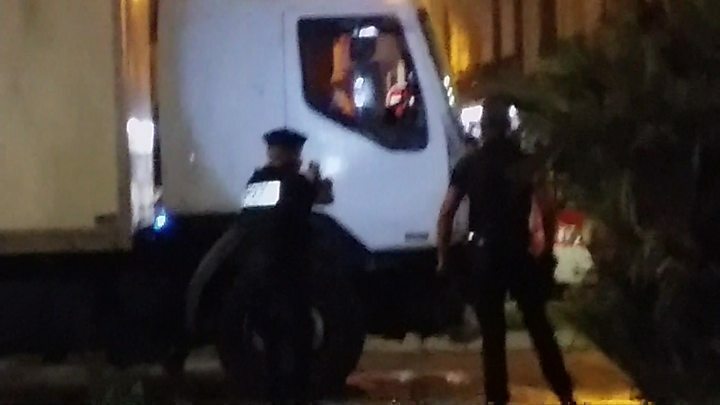 He fired at officers with a 7.65mm calibre automatic pistol when the vehicle was close to the Negresco hotel and continued for another 300m, where his vehicle was stopped near the Palais de la Mediterranee hotel and he was shot dead. There was also a bicycle, empty pallets, documents and a mobile phone. Items were later seized from Lahouaiej-Bouhlel's Nice home. He was known to the police as a petty criminal, but was "totally unknown to intelligence services... and was never flagged for signs of radicalisation", the prosecutor added. However, Prime Minister Manuel Valls told France 2 television that Lahouaiej-Bouhlel was a "terrorist without doubt linked to radical Islamism in one way or another". 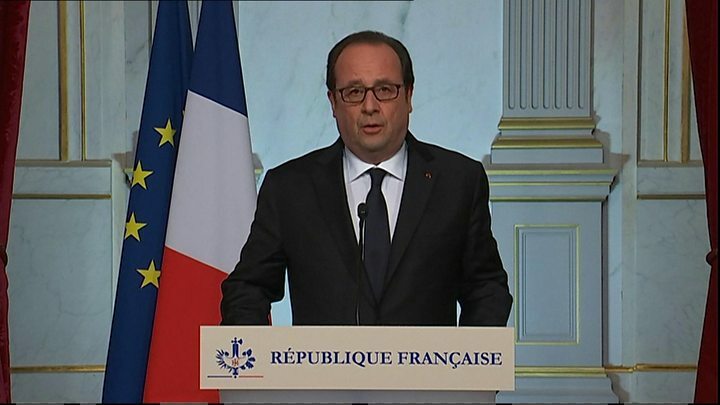 Francois Hollande, who arrived to Nice on Friday, said the attack was of "an undeniable terrorist nature". He said the battle against terrorism would be long, as France faced an enemy "that will continue to attack those people and those countries that count liberty as an essential value". 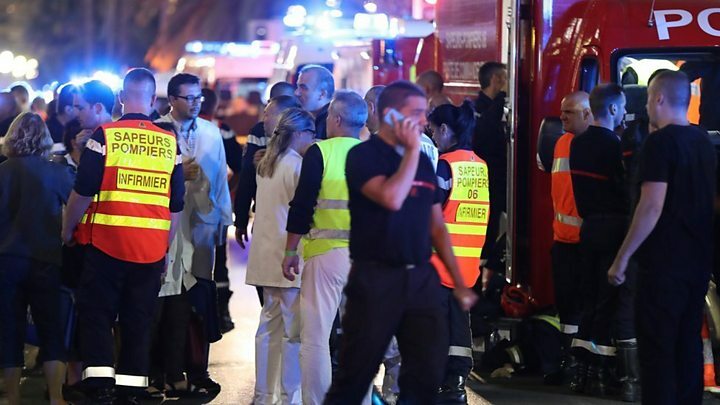 Mr Hollande said the attack was carried out "to satisfy the cruelty of an individual or possibly a group" and that many of the victims were foreigners and young children. "We will overcome the suffering because we are a united France," he said. "As the lorry passed by me a young boy of 10 or so just managed to leap to one side and escape by inches. Tragically dozens of those on foot, young and old alike, were not so lucky. Virtually everyone I saw on the promenade was either dead or beyond real help with truly terrible injuries." The son of Fatima Charrihi, a 60-year-old Nice resident from Morocco, said she was the first to die. He said she "practised Islam in the proper way. A real Islam, not the terrorists' version". The president announced only on Tuesday that France planned to end its state of emergency soon. It will now be extended for another three months. That means police and soldiers on the streets, guarding key buildings. It means scanners and metal arches at some shops and regular bag searches. Gendarme reserves have been called up in support. There are already tighter checks at France's borders. Security services have denied they relaxed after the Euro 2016 football tournament and there has been praise for the relentless job they have done in recent months and for the speed of their reaction last night in Nice. Intelligence gathering has improved but predicting and preventing every attack is impossible. Some are questioning whether even a state of emergency is an effective level of response. The French are being warned they are going to have to live with terrorism. That means some big questions about the nature of "liberte" - one of the founding principles of this nation that people celebrated on Bastille Day. What more do we know about the attacker? Tunisian security sources said Lahouaiej-Bouhlel came from the Tunisian town of Msaken. He visited Tunisia frequently, the last time eight months ago. Media captionA neighbour of the Nice attack suspect says he was frightening and "not normal"
Justice Minister Jean-Jacques Urvoas said the suspect had been given a suspended sentence earlier this year following a confrontation with another driver but this was his only conviction.